As of 5pm Wednesday, Remy Leduc is seven miles away from Dawson City, according to the unofficial GPS tracker, making him the 28th musher to reach the almost-halfway point in the 2019 Yukon Quest. 460 miles into the race, each team has to take a mandatory 36-hour layover at the Dawson checkpoint before continuing on. Reaching Dawson within an hour of Sass and Phillips yesterday were Hans Gatt and Moore in third and fourth, respectively. Paige Drobny, who is celebrating a birthday in Dawson, reached the checkpoint in fifth position at 2:06pm yesterday. The current leader, Brent Sass, won the Yukon Quest back in 2015. He scratched in 2017 and took a break from the Quest last year, while Allen Moore took home his third race championship in his absence. During an interview with APRN, Moore said he expects this year’s finish to be quite different from last year’s. Looking farther back on the trail, Lisbet Norris and Jimmy Lebling are still making their way to Dawson City. Currently, the GPS tracker shows they are both about 80 miles away. To see where the front runners are on the trail, tune into KNOM tomorrow morning (Thursday) at 8am for the next Yukon Quest race update, on 780 AM / 96.1 FM. Image at top: A musher along a snowy trail near Dawson City at night. 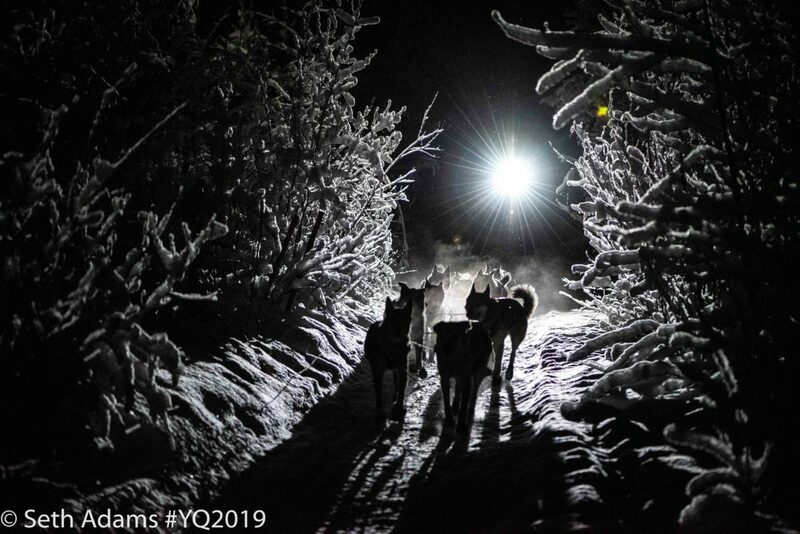 Photo: Seth Adams, Yukon Quest; used with permission.